189 Marlborough is located on the north side of Marlborough, between Dartmouth and Exeter, with 185 Marlborough to the east and 191 Marlborough to the west. 189 Marlborough was designed by Winslow and Bigelow, architects, and built in 1906 on a vacant lot by Bigelow & Mabie, builders, for real estate broker Alexander Sylvanus Porter, Jr., and his wife, Henrietta Goddard (Wigglesworth) Porter. They had married in May of 1905 and lived in an apartment at 330 Dartmouth, until 189 Marlborough was completed. Architectural plans for the house — including elevations, piling plans, floor plans, and framing plans — are included in the City of Boston Blueprints Collection in the Boston Public Library’s Arts Department (reference BIN A-34). 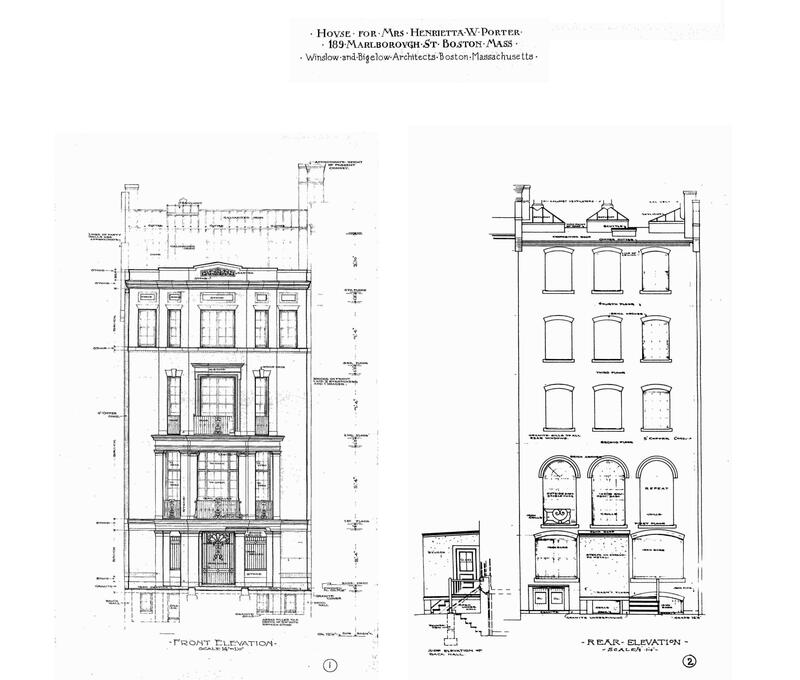 Click here to view the elevations and floor plans for the original building. Henrietta Porter purchased the land for 189 Marlborough on December 13, 1905, from Wilhelmina (Galloupe) Mixter, the wife of Samuel Jason Mixter. She had inherited the lot from her father, Charles William Galloupe, who had died in November of 1903. He and his wife, Sarah Augusta (Kittredge) Galloupe, had lived in Swampscott and at the Hotel Vendôme (where he died). He had assembled the lot through two purchases, a 25 foot wide lot to the west he purchased from George Bruce Upton, Jr., on September 19, 1881, and a 2 foot wide lot to the east he purchased from Edward S. Grew on January 28, 1884. Both lots originally were part of larger parcels purchased from the Commonwealth of Massachusetts on May 31, 1872, by James Lawrence and Thomas Jefferson Coolidge. Click here for an index to the deeds for 189 Marlborough. Henrietta Porter died in March of 1917. 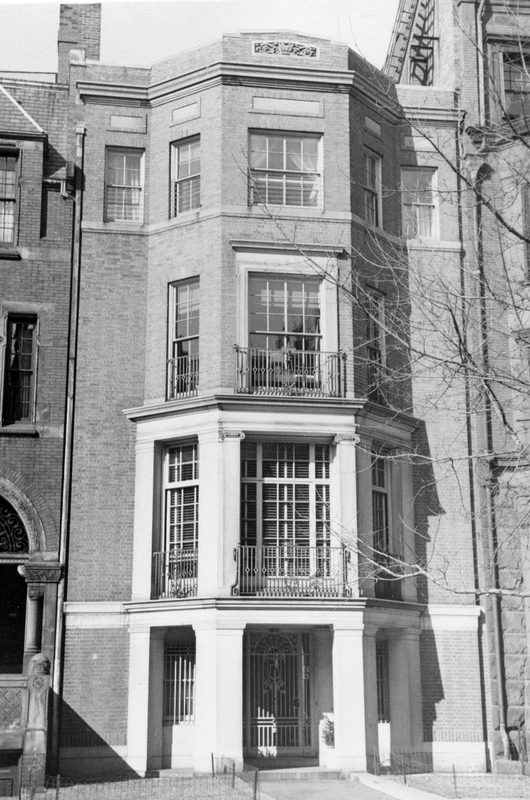 Alexander Porter married again in December of 1919 to Elizabeth Breese Blodget, After their marriage, they lived at 189 Marlborough. They also maintained a home in Brooklin, Maine. During the 1922-1923 winter season, the Porters were living elsewhere and 189 Marlborough was the home of Frederick William Choate Foster and Mabel Gladys (Winslow) Foster. They previously had lived at 10 Commonwealth. 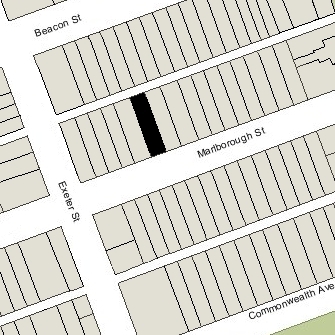 They had moved from 189 Marlborough by the next season and were living in Brookline by 1927. 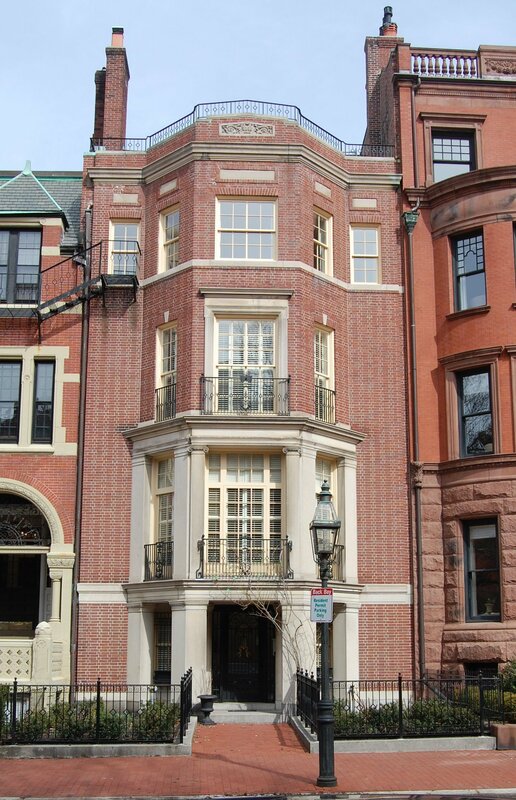 The Porters continued to live at 189 Marlborough during the 1930-1931 winter season, but moved thereafter to Brookline and put 189 Marlborough up for sale. The house was not listed in the 1932-1933 Blue Books, and was shown as vacant in the 1932-1933 City Directories. By the 1933-1934 winter season , 189 Marlborough was the home of investment banker Robert Winthrop Knowles and his wife, Amelia (Amy) Chapman (Thorp) Knowles (grand-daughter of Henry Wadsworth Longfellow). They previously had lived in Cambridge. They also maintained a home, Tower House, in Beverly Farms. Robert Knowles died in June of 1936, and on July 30, 1936, Amelia Knowles purchased 189 Marlborough from Henrietta Porter’s heirs. She continued to live at 189 Marlborough until about 1939; by 1941, she was living at 167 Marlborough. On May 24, 1939, 189 Marlborough was purchased from Amelia Knowles by stockbroker Richard King Thorndike, Jr., and his wife, Lucy Saltonstall (Rantoul) Thorndike. They previously had lived in an apartment at 276 Marlborough. Lucy Thorndike died in May of 1958. Richard Thorndike continued to live at 189 Marlborough until early 1959, when he moved to Beverly Farms. On June 11, 1959, 189 Marlborough was purchased from Richard Thorndike by real estate dealer Morris Haskell Kalman and his wife, Mary (Mooradian) Kalman. They lived at 253 Newbury. That same month, he filed for (and subsequently received) permission to convert the property from a single-family dwelling into seven apartments. On June 30, 1966, 189 Marlborough was acquired from Morris Kalman by Clifford Frank Youse and his wife, Nancy (Rollins) Youse. They lived in one of the apartments. On November 7, 1972, 189 Marlborough was acquired from Clifford and Nancy Youse by Patrick O’Byrne and his wife, Gloria O’Byrne. In April of 1974, Patrick O’Byrne filed for (and subsequently received) permission to add a deck on top of an existing rear ell. On June 17, 2011, they transferred the property to the 189 Marlborough Street LLC, of which they were the managers of record. In September of 2011, they applied for (and subsequently received) permission to remodel the building into five apartments. 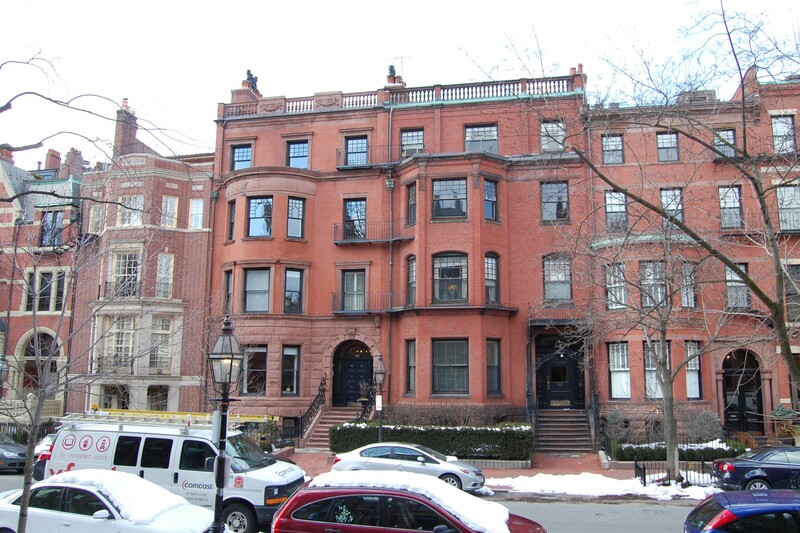 On February 7, 2013, the 189 Marlborough Street LLC converted the property into five condominium units, the 189 Marlborough Street Condominium.